Samuel’s father came to Marcellus in the early 1800’s with his parents and other family members. He bought a piece of land bordering Skaneateles Lake. He sold this land in 1817 which was the time that the family moved to Springwater. Samuel’s mother, Elizabeth Hill Eggleston, also known as Betsy, died in 1823 in Springwater. Some of the children were still quite young at the time of her death. Samuel was about 19 years old. It was around this time that Samuel went back to the area where he had grown up. His older sister Lucy had married Thomas Marsh and they were living in Sempronius, across the lake from Marcellus. Samuel’s obituary indicates that it was Thomas Marsh with whom he lived for 4 years, from age 19 to 23. He learned the tanner’s trade from Thomas Marsh. On August 23, 1827, Samuel married Lurania Powers Burgess. He was 23 and she was 19 years old. They were married by a Baptist preacher by the name of Gordon. After their marriage, Samuel and Lurania made their home in Sempronius. Their first son Dwight was born August 9, 1828 and died the following year August 2, 1829. The family Bible indicates that he was born in Sempronius and died in Springwater, Livingston County. Samuel as well as his father Samuel Sr. and father-in-law Harvey Burgess are listed on the 1830 Census in Springwater, so they apparently lived there with both families for a short time. Samuel and Lurania’s next child Benjamin was born April 6, 1830, back in Sempronius and lived only a few weeks. He died April 27, 1830. While living in the Sempronius area Samuel and Lurania had four other sons: Reuben Burgess born July 24, 1831; Edwin, born October 25, 1833; Harvey Burgess born February 8, 1836; and Orson Hyde born October 3, 1841. The Thorn Hill Baptist Church in Marcellus, where Samuel grew up could be considered a “closed communion” church as their Articles of Faith indicate that only baptized members could take communion. Samuel’s father was a member of this church but was disfellowshipped about the time that the family moved to Springwater. There is information in the church records that Samuel Eggleston later joined “another church of our faith and order.” This would have been in Springwater. Samuel and Thomas Marsh were associated with Free Will Baptists in Sempronius. Cyprian Marsh, son of Thomas and Lucy Marsh kept a journal in which he related events of the time and his conversion to the Church of Jesus Christ of Latter-day Saints. He mentioned hearing about the Book of Mormon and heard early local convert Zera Pulsipher preach. In 1832 Mormon Elders, Orson Hyde and Samuel H. Smith went on a Mission through New York. They spent about five weeks in the area of Skaneateles Lake. They were well received and had a good deal of success in the area. Both of their journals mentioned staying at the home of Thomas Marsh in the town of Sempronius. May 2 they went to Sempronius and held a meeting in the evening to a large congregation. It is very likely that Samuel and Lurania attended this meeting or another one held the following day. Apparently seeds were sown from hearing these men preach, though it was several years before Samuel and Lurania joined this church. This may be the period referred to in Samuel’s obituary when he “held himself aloof from Christian institutions for a long time.” Having religious backgrounds, both Samuel and Lurania may have spent this time studying and contemplating, before making a commitment to join a new Church. In 1840, Elder Pelatiah Brown served a mission in Cayuga County. On June 1, 1841 Elder Brown baptized Samuel and Lurania into the Church of Jesus Christ of Latter-day Saints. Shortly after Samuel and Lurania’s baptism a Branch of the Church was organized in West Niles, Cayauga County. Samuel indicated that Thomas Marsh was made Branch President. He had apparently been baptized sometime before this as well. 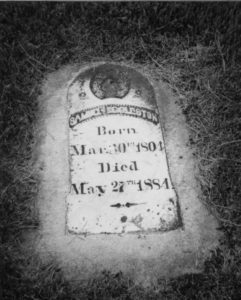 Lucy Eggleston Marsh had died in 1832. Apostle Willard Richards was returning from a mission in England in July 1841, and passed through the area, meeting with Saints along the way. Samuel indicated that he was ordained a teacher by Apostle Willard Richards at the time the Branch was organized. Willard Richards’s journal mentions him being in “New Hope in Niles” on July 17-19, 1841. “Elder Thomas Marsh” is mentioned and on the date of July 19 it says: “Teacher Samuel Eggleston”. Samuel’s obituary gives the date of his ordination the 18th of July. A few months after their baptism, October 3, 1841, another son was born to Lurania and Samuel. They named him Orson Hyde Eggleston. They must have been very impressed with Orson Hyde to name their son after him. We can only imagine how Samuel and Lurania’s families and friends reacted to their joining this new Church. Accounts of other converts would suggest that there was at least conflict, and at worst outright persecution. Isaac Haight mentioned in his journal that he and his wife were baptized 3 March 1839 “much to the mortification of our friends.” The reaction was probably similar with Samuel and Lurania’s Baptist relatives and friends. Their decision to join with the Saints in Nauvoo may have been in part because things became uncomfortable for them there, but most likely it was in keeping with the Church’s counsel at that time to “gather to Zion” which was then Nauvoo. By the time Samuel and Lurania arrived, Nauvoo was a growing and thriving city. The Eggleston home in Nauvoo was located on Lot 1 of Block 62 on the corner of Hibbard and Woodruff Streets, only a few blocks north of the Temple site. Their lot would have been large enough for a garden, but Samuel did not have sufficient land to farm in or outside of the city. Samuel and Lurania were involved in the activities and witnessed all the events of that time in Nauvoo. Samuel worked on the Temple, then under construction. It was a common practice for men to work one day out of ten on the Temple as their “tithing.” Also like most men in Nauvoo, Samuel was a member of the Nauvoo Legion. He was elected first sergeant of a company in the Nauvoo Legion and later Captain of the same company. “Oct. 7, 1842—This day the teachers met in Nauvoo and organized into a Quorum by appointing Elisha Averett Pres., James Huntsman and Elijah Averett, Counselors, Samuel Eggleston, scribe and 11 members” (vol 5:161-History of the Church-Joseph Smith). This would have been only a short time after Samuel arrived in Nauvoo. Samuel was later ordained an Elder and a Seventy in October 1844. He was a member of the Ninth Quorum of Seventy. Meeting notes mention in most meetings the members “speaking their feelings”, so Samuel was probably an active participant in the Quorum. The 9th Quorum of Seventy kept track of its members after they left Nauvoo, with Samuel being listed as being in Iowa May 29 1852, and in Kanesville, Iowa March 10, 1953 and 23 April 1856. Samuel and Lurania received their endowments in the Nauvoo Temple January 9, 1846, and were sealed January 28, 1846 in the Nauvoo Temple. At this time there was much urgency to endow as many Saints as possible before leaving Nauvoo, and Samuel and Lurania would have joined the crowds waiting for this privilege. Samuel’s account says they left Nauvoo “in the spring of 1846”. They may have stayed because of lack of funds or supplies, attempting to sell land, or to assist with completing the Temple. The largest numbers of Saints left Nauvoo between March and May. The Temple was finally completed and dedicated May 1, 1846. The Egglestons went to Winter Quarters in Nebraska, where the Saints gathered to prepare to go further west. There small cabins were built where they spent a miserable winter. Many of the Saints were ill prepared for such a trip. There was inadequate food for the many refugees camped there and diseases spread easily. Another son, Samuel, was born to Lurania and Samuel in Winter Quarters, January 16, 1847. Patty Sessions was Lurania’s midwife and recorded the birth in her diary. Her account book shows that Samuel Eggleston paid $2.00 for her services Jan 16. This child lived only until August 2, 1847. He was buried in the Mormon Pioneer Cemetery in Winter Quarters. Family tradition says that Samuel was asked by Brigham Young to remain to make shoes for the Saints who would be traveling west. This may have been a reason initially, however other factors may have influenced them to stay so long. 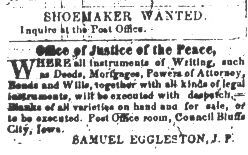 Samuel did have a Boot and Shoe shop in town and advertised in The Frontier Guardian. 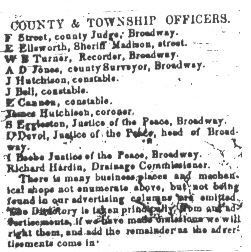 This Ad ran from March 6 to June 12, 1850. Samuel’s name is not given, but the location would indicate it was his shop. 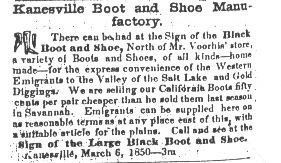 A Guardian and Sentinel Directory published in the Frontier Guardian and Iowa Sentinel from March 24 to May 12, 1853 lists: Shoemaker Shop, Samuel Eggleston-Next to the Bridge, Madison. Samuel also worked as a Justice of the Peace at this time and performed marriages. Samuel and Lurania eventually owned a great deal of land in Pottawatamie County. Samuel was a Notary Public for nine years. Pottawatamie County Deed books show deeds written and recorded by Samuel Eggleston, Notary Public. Samuel also served as Postmaster for five years. Before the Saints came to Council Bluffs, it was only a trading post and Indian agency. Through the next few years, settlements were made, with all the elements of civilization that the Saints had brought to Nauvoo. It appears that Samuel and Lurania were part of this civilizing influence and took an active part in the established community of these growing frontier towns. The first schools in the area were established by Mormon settlers, which schools their children would have attended. Council Bluffs also became a major outfitting point similar to Independence and St. Joseph, for those migrating westward. Samuel’s shoemaking business would have been a valuable asset to the community. Map of Kanesville. X on Lot 80 shows where Samuel’s Shoe Shop was located. The arrow points to Lot 46 which Samuel owned and where they likely lived. Kanesville in 1850 had a population of about 400, all Mormons. The buildings were all made of logs, and mostly one story. The main streets in Council Bluffs or Kanesville were Hyde Street, later named Madison and Main Street which was later named Broadway. The early business district was in the area where these two streets intersect and extending down further both ways on Broadway or Main. Samuel’s Shoe Shop was on Madison Street, by the bridge, which was near where Broadway intersected Madison. Most of the early residences extended up the glen on First Street. Samuel owned land in Council Bluffs on Lot No. 46 which was on First Street, also described as the road to the Cemetery. Sir: The last mail brought me news that a large portion of the business part of Council Bluff City has been destroyed by fire. The amount of property was very large; but the amount of loss to the owners is uncertain, not knowing what amount of insurance there was; but it is presumed that but a small portion was insured, as the rates were very high, owing to the combustible materials of which the buildings were made. “On the night of the 11th of November, between 10 and 11 o’clock, a fire broke out in the store of Tootle & Jackson, and spread both ways, east and west, consuming every building until it reached Murphy’s store. “Such a sight my eyes never before beheld. In the space of about 30 minutes, the whole block was in flames. You cannot conceive, neither can I describe the scene that took place. It seemed for a time, that the whole city was to be consumed. For miles, it was as light as noon-day. We could see men, women, and children, running in every direction, throwing water, tearing down houses and other buildings, in order to stop the progress of the flames. From other letters from Messrs. Voorhis and McMahon, this letter is fully corroborated; but yet, it seems that there is a determination on the part of the sufferers to re-build with more substantial materials. The rail-road excitement is on the increase, and from all appearance, Council Bluff City is destined to become a point of considerable interest. Samuel and Lurania’s son Harvey died February 12, 1854, in Council Bluffs. The circumstances of his death are unknown, though it is interesting that his death was just a few months after this devastating fire. Around 1856-1857, Samuel moved to Crescent City, a few miles north of Council Bluffs. A History of Pottawattamie County lists among early settlers of 1857, S. Eggleston. Samuel’s autobiography states that he “was elected Justice of the Peace in the first election held in Pottawattamie County, which office I held for 10 years.” This would have included service in Council Bluffs and later in Crescent City. A History of Pottawattamie County indicates that at the first election in Crescent City, A. J. Williams and Samuel Eggleston were Elected Justices of the Peace. There is no date given for this “first election”, though it likely was in 1857. 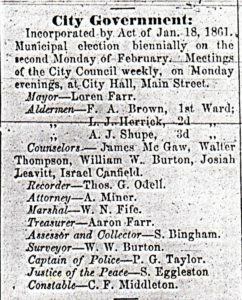 The Crescent City Newspaper, The Oracle, dated Oct. 22, 1858, printed Election Returns for Pottawattamie County Elections. Among those listed is Justice of the Peace, Samuel Eggleston, Wm D. Frazier. A History of Pottawattamie County mentions Samuel Eggleston as having one of the first businesses in Crescent City. Joseph E. Johnson, who had owned several businesses in Council Bluffs, erected the first business house in Crescent City in the spring of 1856. This was located on the north side of Florence Street, west of Johnson Avenue, obviously named for him. Samuel Eggleston built another building shortly after that on the southwest corner of Florence Street and Johnson Avenue. The Eggleston family owned considerable amounts of land in Pottawattamie County, some in Council Bluffs and more in Crescent City. In 1852, L. D. S. Church President Brigham Young called for all the Saints in Iowa to come to Utah. There was a great migration that year and many accounts indicate that “all of the Saints left Iowa and went to the Salt Lake Valley.” Many did go on to the Salt Lake Valley then, though some remained. For some reason the Egglestons did not go in 1852 with this large migration. Pottawattamie County newspapers printed news from Salt Lake City and about the Pioneer Companies heading to Zion, so they apparently maintained close contact with the Saints in Utah. After the migration of 1852, the town was described by some as “deserted” and the departure of Orson Hyde left them without a church authority presiding. Changes in the Mormon immigration route from Europe shifted in 1854, with ships sailing into Boston, New York or Philadelphia, rather than traveling up the Mississippi River from New Orleans. With these changes and the railroad going further west, Council Bluffs was no longer the starting point of the trail west for the Saints. The Egglestons remained as part of the established community, though the atmosphere in Council Bluffs was probably very different. Perhaps this was because of their business, public service and land holdings. The move later to Crescent City may have been because of undesirable influences in Council Bluffs, or because of the availability of new land and opportunities in a newer community. After the Civil War started, there was another, probably more urgent call for all Saints to leave the eastern United States. The migration of Samuel and Lurania’s family to Utah in 1861 and 1862 was likely in response to this call. William Ellis Jones relates in his diary that in November (probably 1860) several Elders from the Salt Lake Valley came to Council Bluffs. Among them were William Martindale and James Wareham. James Wareham would later lead the company in which Samuel and Lurania came to the Valley in 1862. These Elders stayed in the neighborhood all winter. During that time they organized a Branch of the Church in Crescent City. William Ellis Jones was made Branch President with Br. Eggleston 1st counselor and Br. Henry Brooks, 2nd counselor. Orson’s autobiography mentions that in the winter of 1860-61 his “father and mother renewed their covenants by baptism and I was baptized into the Church, was ordained an Elder that winter, also my brother Reuben.” It was a common practice for members to be re-baptized as a sign of re-commitment. Since the Church members had been without strong Priesthood leadership since Orson Hyde left in 1852, there may have been some apostasy or straying. The efforts of these visiting Elders was probably directed toward setting the affairs of the church in order. This would involve organizing Branches as well as dealing with individual members. Samuel and Lurania’s oldest living son, Rueben was married July 15, 1856 to Emeline Allen. Orson indicates that “In the summer of 1861 my Brother Reuben and family and myself came to Utah and settled in Ogden.” They traveled together with the David H. Cannon Company. Bartlett Tripp, clerk of this company, recorded a list of company members in his camp journal. Listed is Reub. B. Eggleston, wife and 1 child, Orson Eggleston, 4 oxen, 1 cow, 1 wagon. Orson was called to be a teamster the following year and returned to bring others to Utah, including his family. They traveled with the James Wareham Company, which left Iowa in July 1862. Samuel and Lurania sold much of their land in Pottawattamie County just prior to that. 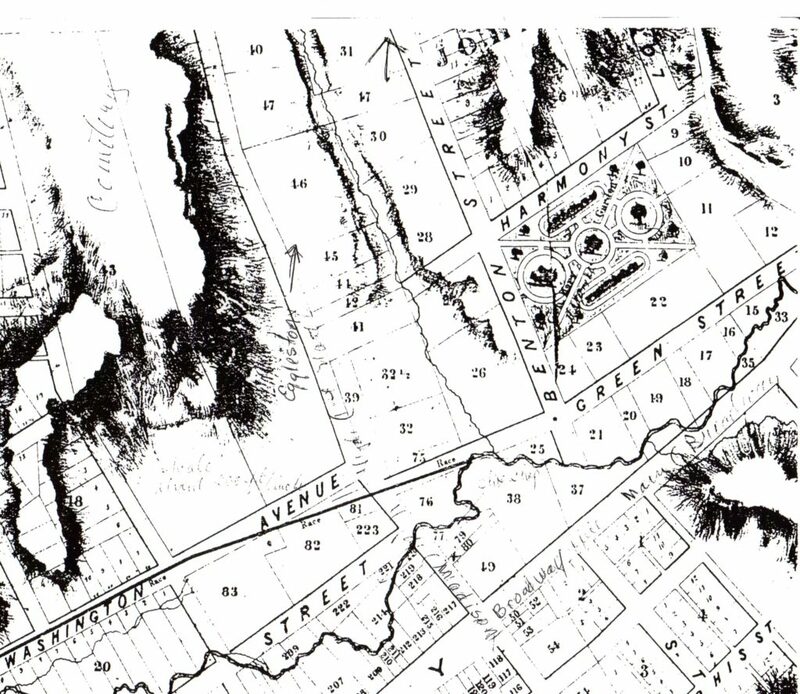 The Deseret News reported, 16 September 1862 –The day was warm in G. S. L. City. Elder Amasa M. Lyman & Charles C. Rich & Co arrived in Salt Lake. Capt James Wareham’s Independent Co. members—Samuel, Lurania, Orson H. & Mary E. Edwin, Eliza R. Charlotte & John H. (Journal History 16 Sep 1862) Edwin came to Utah then with his wife and two children, but later returned to Council Bluffs. Samuel and Lurania settled in Ogden, Utah. They were members of the Second Ward where Samuel was ordained a High Priest in 1863 (Church Hist dept notes says 1864) by F. A. Hammond and others. May 30, 1877 he was set apart as First Counselor to Bishop Robert McQuarrie of the Second Ward. His obituary indicates he held that position until his death. He was ordained a Patriarch by George Q. Cannon, Joseph F. Smith, F. D. Richards and D. H. Perry on October 24, 1882. Samuel continued to work as a shoemaker in Ogden. 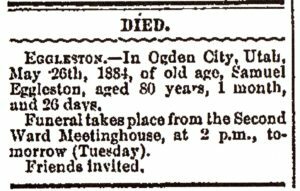 In 1877, the “Ogden Junction” published a list of shoemakers which included Samuel Eggleston.Samuel also served as Justice of the Peace in Ogden. Samuel appears to have been a well respected member of the community in Ogden. He served faithfully in leadership positions in the church as well as public service. He apparently was a close friend of prominent leaders in the area. 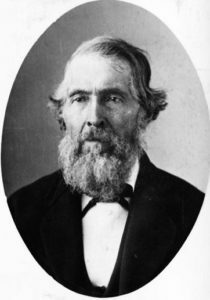 The first Mayor of Ogden, Lorin Farr, who was also his daughter’s father-in-law, and Apostle Franklin. D. Richards, who was the presiding L.D.S. authority in the area, spoke at his funeral. Samuel was involved in community events and decisions. Heart Throbs of the West Vol. 3 tells about the building of the Ogden Tabernacle. This would have been one of the most significant buildings in the city. This building had been dedicated around 1859-1860, prior to Samuel’s coming to Ogden. December 24, 1880 a petition was presented to the city council requesting that the land known as Tabernacle Square to be conveyed to David H. Peery, Lester Herrick and Charles F. Middleton in trust for use of members of the L.D.S. Church. Among signers of this petition were Franklin D. Richards, Chris Flygare, Winslow Farr, John Hastings, Winthrop Farley, F. A. Hammond, Samuel Eggleston, B.C. Critchlow, James Burch and Joseph Taylor. Mary Elizabeth Mumford would have only been 16 years old in 1870 and the marriage date is only a few months after Lurania’s death. It is possible that she was a recent immigrant from England, who had no family here and he was encouraged to marry her to provide her with a home. I have found no other mentions of her and wonder if this marriage lasted any length of time. The marriage to Catherine Kat was only a few months after this marriage, but there is no indication in any family records, letters, etc., that Samuel was a polygamist and was married to both at the same time. Catherine would have been considerably younger than Samuel, but about 35 years old at the time of the marriage. In letters Orson wrote to his father from his mission to Michigan in 1876 he says “My respects to Catherine and all the rest”. Samuel’s journal entries in his copy of “The Times and Seasons” mentions only a wife in 1779 and 1883. Samuel’s obituary mentions only his “widow”. No names are given in either of these. Samuel owned a bound volume of “The Times and Seasons”. This was a newspaper which had been printed in Nauvoo, Illinois. Papers from 1842 and 1843 were bound in this Volume IV, which he owned. On the front blank pages in the book, Samuel made some journal entries. Samuel died May 24, 1884. He was buried in the Ogden City Cemetery next to Lurania. His funeral was well attended and he was eulogized by prominent members of the community. He did leave a will. Because of the length of this post, Samuel’s Obituary and funeral program as well as his Probate Record are in a separate post. “History of Pottawattamie County Iowa” (Chicago: O.L. Baskin & Co., Historical Pub. 1883) p. 285-292. Pottawattamie County Newspaper Articles and Advertisements: “The Oracle” Oct 22, 1858; “The Frontier Guardian and Iowa Sentinel” 1852, Dec 23 or 30—1853, May 12; 1853, Mar 24-May 12; “The Western Bugle” 1852, Oct 27-1853, Dec 21. “Mormon Midwife, 1846-1888 Diaries of Patty Bartlett Sessions” Edited by Donna Toland Smith (1997 University of Utah Press) p. 70. Beneath Ben Lomond’s Peak by Milton R. Hunter, p.321 quote from “Ogden Junction”, p. 151, and p. 511. This entry was posted in Biographies and tagged Eggleston, Illinois, Iowa, Nebraska, New York, Pioneer, Utah. Bookmark the permalink.